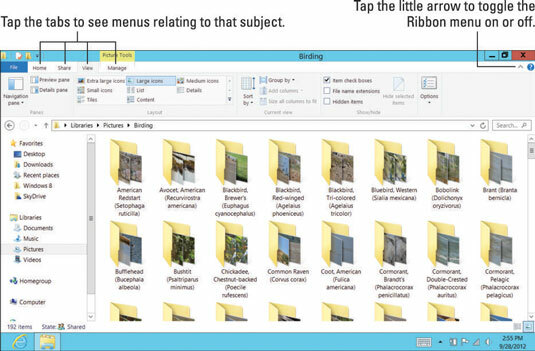 Familiar to people who’ve used the latest versions of Microsoft Office, the Ribbon menu now appears as a staple atop every folder in Windows 8. The Ribbon menu is simply a thick strip of options that dangle from the top menu bar. When looking for items on the Ribbon menu, remember to look at the little tabs across the top. Tap a different tab — the View tab, for example — and the Ribbon menu changes to show all the options controlling how you view the window’s contents. Similarly, tap the Share tab, and the menu changes to show different ways you can share items in the window. The Ribbon menu’s large menus and buttons come in handy on a tablet, and you may miss the Ribbon should it suddenly disappear. If your Ribbon menu falls off the top of your folder, put it back by finding the little arrow shown. That arrow serves as a toggle switch. Tap it to either hide the Ribbon or bring it back into view. Hiding the menu gives you more workspace, and tapping a tab always brings the hidden Ribbon menu temporarily back into view. Leaving the Ribbon menu turned on, though, makes it faster to tap a menu item. There’s no right or wrong way with this one. Experiment with leaving the Ribbon menu turned on or off, and see which one you prefer. The key here is knowing how to switch between the two modes.